In charge of business development and planning of the LINE Beacon platform (Messaging API, LINE Beacon, Customer Connect). Hello, my name is Charlotte Yu and I am currently in charge of the business development and planning of the LINE Beacon platform in Taiwan. One of the projects I’m working on involves using LINE Beacon as a feasible location contextual technology which can play an important role in LINE’s “Smart Portal” concept to bring people, information and services closer together and march toward our mission of “CLOSING THE DISTANCE”. Currently, at this early stage, we are focusing on creating successful beacon deployments and use cases to raise user awareness and usage rates. Our strategy behind the LINE Beacon platform is to take advantage of LINE’s extensive user base and other LINE services and features popular in Taiwan. We believe that location-awareness will be a driving force in the advancement of mobile technology, and that’s why we are building a beacon network by deploying LINE Beacon to as many places as possible. This is in line with two key factors of the online-to-offline (O2O) ecosystem: geo-linked applications using location-aware technology and platforms with a high user base. O2O messaging is used to connect the online digital platform to offline merchants. In terms of commerce, the aim of O2O is to drive customers from the online marketplace and platforms (where they spend most of their time) to offline brick-and-mortar stores. This can happen through digital coupons, membership cards, and proximity marketing. That’s why we designed various beacon applications to build online-to-offline networks where the virtual world expands to the real world. O2O and beacons link everyday products and features such as LINE Coupon, LINE Points, and LINE Shop Card to drive sales. We can push GeoADs (geo-linked advertisements) to promote stores, clients, and events with LINE business accounts (such as official accounts or LINE@ accounts) to nearby LINE users. By encouraging LINE users to walk into stores using LBS (location-based service) incentives such as coupons and stickers, we can enhance the user experience and help LINE@ owners, who have an LBS add-on such as indoor navigation or a shopping guide, achieve higher user retention rates. To evaluate the feasibility and stability of applications on the LINE Beacon platform, we launched several pilot tests during the past several months. Below are summaries of each pilot and the lessons we learned along the way. Our business partners often ask the same question: How do we convince our customers to enable Bluetooth on their devices? At first, we planned to remind LINE users to enable Bluetooth on the value proposition offered during onboarding. For example, through pushing coupons with higher discount rates to attract nearby users who walk into stores. However, as this was the very first LINE Beacon pilot in Taiwan, we decided to go without any promotions or instructions to collect the rawest data to base our future pilot evaluations on. At the end, we saw 38.50% of the tested users enabling Bluetooth on their devices. This idea came from a LINE employee who planned to use our newly-released photo sticker feature (released in early October 2016 in Taiwan) to send their own wedding photo stickers to guests who attended their wedding party. Since we believe that location-based applications can provide opportunities to engage with users at the right time and at the right place, we thought that this wedding would be a good chance to verify how beacons can be used at offline events such as wedding parties, birthday parties, concerts, and so on. Surprisingly, we saw a 27.9% conversion rate (number of stickers sold/friend count) even though most of the guests had no previous experience of purchasing LINE stickers from the store before. To follow up on this successful case, we launched another beacon for mission stickers at the Taiwan TechPulse event. You can find out more about the Taiwan TechPulse event and how the stickers were used from our LINE Engineering blog, “LINE Taiwan TechPulse 2016 Recap“. This field test was the largest in scale among our 2016 pilots. We prepared this field test to reinforce our original concept of LINE Beacon GeoAD, with LINE Beacon devices deployed at densely populated public areas such as MRT stations and bus stops. To drive innovative, high-performing ads, we needed to pinpoint users to which GeoADs are delivered. For our GeoAD concept, adopting a general beacon spec could have been more beneficial to us. In the long run, we can form a stronger ecosystem by leveraging a partner’s beacon. However, due to security and privacy concerns, we eventually decided to use our own beacon specification, which can be used in LINE’s business accounts (such as official accounts or LINE @ accounts) with full control and security. 80% of users used their smartphones when waiting at the bus stop. 35% of users enabled Bluetooth on their devices. 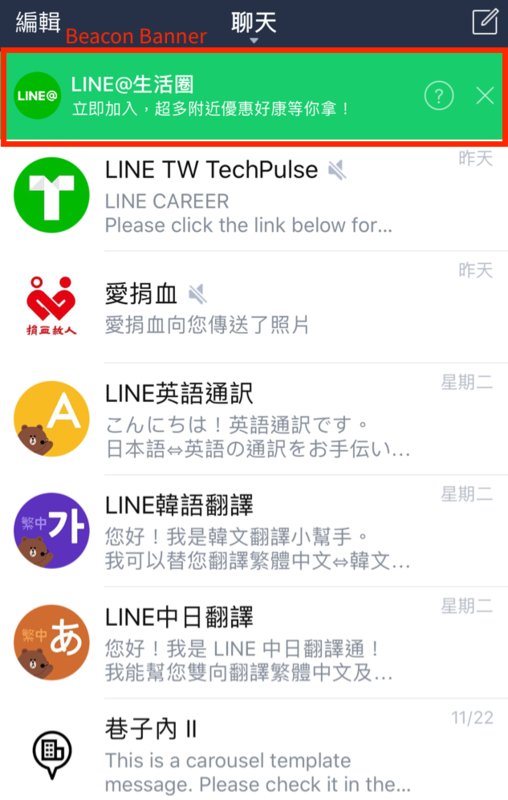 90% of users used LINE when using their smartphones. Only 1% of users clicked the beacon banner. These numbers remind us that multiple factors can affect the outcome: the location of where LINE Beacon is deployed, what is offered on LINE Beacon, and how each user has different usage patterns. Users might not notice special offers from nearby merchants while checking when their bus will arrive. In other words, according to LINE users’ behavior at bus stops, bus stops are not good enough to meet economies of scale. One idea we had from looking at the results was to design gamified use cases to attract users. Based on the result and lessons learned, we were able to see the potential and recognized the strategic importance of O2O activity. We expect to enable real-time interactions between merchants and their customers, enhancing the user experience at various venues and stores, creating entirely new possibilities by providing personalized information delivery based on real-time locations and interests.